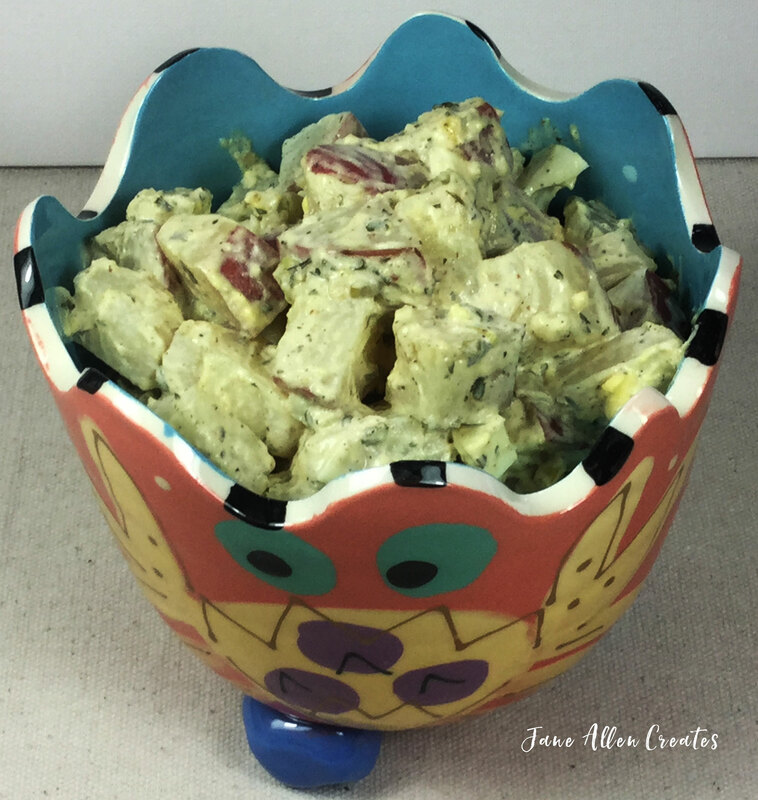 Since Memorial Day is the official start of picnic season I thought I would share with you my favorite potato salad recipe which is from “The Perfect Recipe” by Pam Anderson. I would highly recommend this cookbook. To hard boil the eggs place them in a single layer in a pan and cover with water. Bring to a boil and continue cooking for five minutes, then put the lid on the pan, turn off stove, and let sit on burner for 5 more minutes. Pour off water, roll eggs in pan to crack shells and then cover with cold water. Begin peeling starting at the wide end. I usually pour off water, give the eggs another roll and add more water a few times as I am peeling the eggs. Rinse eggs, allow to cool and dice. This is the secret that makes the salad so yummy: while the potatoes are still hot layer them into your container and sprinkle with the vinegar, salt and pepper (see recipe below.) Then mix in remaining ingredients and refrigerate. (I am not a big pickle person, so I don’t add the pickle). Stir before serving and adjust the ingredients if needed. Now all you have to do is enjoy. I hope you have an enjoyable and safe holiday season. 1. Layer warm potato cubes in a medium bowl. Sprinkle with vinegar, seasoning with salt and pepper as you go. 2. Mix in remaining ingredients. Refrigerate until ready to serve. Adjust seasonings and serve chilled. Thank you for the recipe and tips Jane. I love potato salad and use a recipe almost the same as this……I agree the “secret” is mixing everything while the potatoes are still HOT! It is amazing the difference it makes the seasonings on the hot potatoes. My husband is a big potato salad person and this is his favorite. Have a wonderful Memorial Day. Hi Jane, I too love potato salad and like seeing new receipts for it! I add radishes to mine to give it a slight kick and I like using green onions too. The crunch of the radishes would be nice too. Have a good holiday weekend. Thanks Amy have a good holiday weekend!